Indiana Housing has been instrumental in providing no downpayment loan programs for first time home buyers. They now offer a loan program for home buyers who are moving up or buying their next home, aptly named the 'Next Home' program. Many home sellers today are faced with breaking even after the sell of their home and do not have the additional funds to put a down payment on their next home. The new program from Indiana Housing offers up to 4% toward down payment and closing costs. So a home buyer can buy their next home with no money down. 4% given to home buyer (borrower) to be used toward down payment, closing costs or pre-paids. Seller can contribute up to 6% toward buyers closing costs and pre-paids. There are quite a few differences between the first time home buyer program and the Next Home program. The most significant are the income and repayment of the down payment portion. Both programs require a second loan at zero interest for the down payment portion. The loan for first time home buyer's has to be repaid when the home is sold. With the Next Home program, the loan is forgiven after two years. 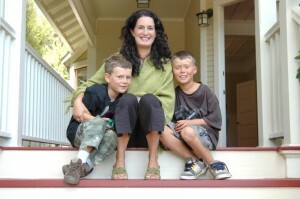 The income guidelines for first time buyers is set by Indiana Housing guidelines and the Next Home uses FHA guidelines. A family of four, buying their next home in Indianapolis, using this program can have a household income up to $85,875.00. Good news is, first time home buyers can also use the Next Home program, allowing a higher income first time buyer to take advantage of lower upfront costs.This is a pilot program and Indiana Housing uses specific lenders for their programs. It's good to see programs like this. In my opinion it might not pull us out of recession, but it def "softens" the effects of a recently depressed housing market. Way to go Indiana! I don't think zero down payment assistance is NOT what the market needs. It will, in my opinion, create a smaller bubble that will perhaps decrease inventory and stimulate the market only temporarily. It won't fix things. In all honesty, if you can't get 3.5% together and get some skin in the game, you are playing the wrong game. Would you lend $250,000 to someone with nothing to lose but a credit score? Candice - I believe it's a great opportunity for move up buyers who are not able to realize gain from the sale of their current home. It provides them options for buying a larger home and take advantage of a buyers market where they may not have been able to do so. Zachary - I don't expect it to pull us out of recession either, but it's a great program for people who want to move up and keep home owners in the market. My family is in this situation. Outgrew our starter home, but don't have equity in it. Been on the market for over 2 years, we cannot simply keep lowering the asking price and keep both money to get out and a down payment. This program seems to make sense for those of us stuck. By stuck I mean in starter home neighborhoods foreclosed homes are selling for pennies on the dollar, why would you buy one at full price? We are consumers ready to throw $$ into a bigger home but can't afford 2 mortgages. This program in effect helps us soften that blow by allowing us to save like hell to afford to move out and then not have to worry about having the large chunk of money for a down payment. It's good to hear programs like this. A lot of people can definitely benefit to this program. More luck and Happy Sales! There are advantages and disadvantages to this program. First, I have to agree with Post #2 to a degree. Even though it is nice for buyers to save 4% on the purchase of a home, it requires little investment on their part and therefore nothing to lose. The good part is that many homes for sale can be bought up fast with this program and if that drives the price up, it might help the housing market improve. Its nice to read blogs the promote assistance to troubled borrowers. I appreciate how you listed the benefits of the program in a comprehensive layout, allowing your readers to gather the information with ease. I am glad to have found this blog. Thanks for sharing this great information.